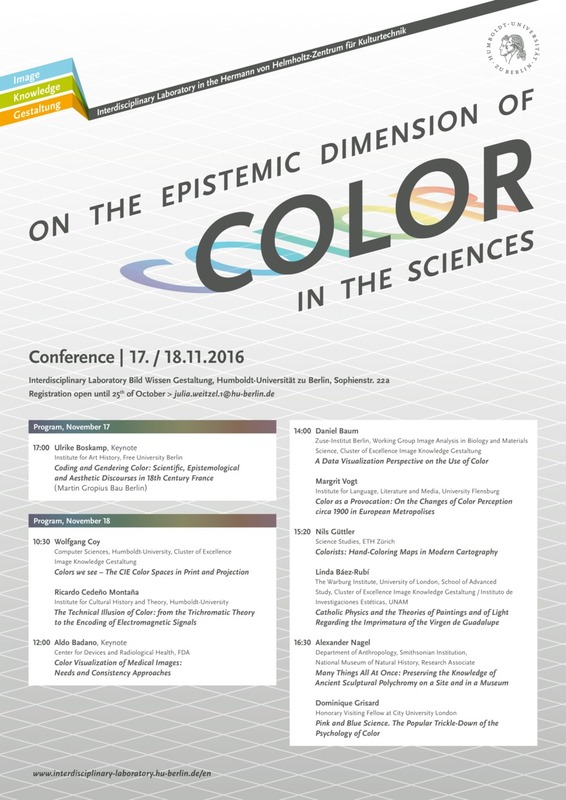 Next, 18th November I’ll be presenting a short paper in the conference On the Epistemic Dimension of Colors in the Sciences at the Interdisziplinäres Labor Bild Wissen Gestaltung in Berlin, Germany. Encoding schemes for producing, storing, and transmitting colour information in electronic media are based on a three-colour canon that originated in the 19th-century physiological studies of vision. During the 20th century this canon was first standardised and then implemented in several technical media. Since then it has become ubiquitous for understanding and producing the illusion of colour. This paper proposes a historical account of how the additive three-colour canon was set in the laboratory and how it was transferred over to electronic technical media. The first part will focus on the scientific origins of this canon. Building on Thomas Young’s trichromatic theory, during the 1850s, Hermann Helmholtz empirically demonstrated that the three types of sensory receptors responsible for colour vision are primarily sensitive to one range of wavelengths, with one sensitive to reds, one to greens, and one to violets. His work set the blueprint for the principle of colour mixing in technical visual media, in which the weighted combination of three different colour signals suffices to form a full colour space for the human visual system. The second part will focus on three implementations of this principle that have dominated electronic visual media ever since. These are: (i) the characterisation of an standard observer in the Colorimetric Resolution I by the Commission Internationale de l’Eclairage (CIE) in 1931, (ii) the implementation in the NTSC analogue television of the colour system patented in 1939 by the French engineer George Valensi, and (iii) the ITU BT.601 recommendation for encoding digital video as a three-colour component signal from 1981.